SAOR is an Atmospheric Black Metal one-man project from Scotland and its music fits the genius loci of that land well: the beauty and majesty of the melodies and atmosphere and the lushness of the instrumentation seem to have a parallel in the beauty of the land of gorgeous emerald rolling hills, but the music also has a bit of grimness and coldness that corresponds to the harshness of the land’s climate. Together with DRUDKH this band was my “gateway drug” into Black Metal, and even though I haven’t followed SAOR super closely in the recent years (I mean since the debut “Roots”), I have some sentimental attachment to this band (or rather project). Since releasing its debut in 2013 SAOR has released two full-length LPs, the last one called “Guardians” came out in 2016 and was very well received by fans and critics. Let’s see what the fourth album has to offer. We find three longer songs – ranging from circa 10 to 12 minutes in length – on the album plus one shorter, minimalist acoustic piece that closes the album. The opener, which is also the title song, has a quite intense start with fast drumming and melodic tremolo picked riff, but not long into the song the intensity wanes a little and guitar and violin lead melodies take center stage. A mellow section with acoustic guitar and lead guitar melody prepares the explosive comeback of the main riff now with deep growled screams joining in with the guitar. The song has an atmospheric mid-section with piano and vocal chants that introduces another section with emotional guitar melody accompanied by a flute and strings as well as impassioned high-pitched vocals – and of course there is a super uplifting climax with blast beats and heart-wrenching screams. “Monad” has a sweet-sounding, upbeat opening, with a mellow intro, violin and guitar lead melodies and driving rhythm, but soon takes a darker turn. This sinister sounding section has a majestic, catchy riff over which Andy Marshall delivers his deep “barked” growls. The tension of the verse is released in a chorus with clean vocals backed by a pleasant guitar melody. A mellow, minimalist section precedes the final section with a tuneful riff and violin melody. The climax doesn’t work for me completely – generally all the melodies are catchy on this record, but this comes across as a bit schmaltzy to me. The twelve minutes long piece “Bròn” goes from sinister to sweet-sounding. It has a catchy dark verse riff after which comes a bridging section with a melodic violin riff that leads into a big chorus with a catchy, dreamy female vocal melody. The chorus sounds really euphoric also because there is a release of tension from the previous section. After a mellow string mid-section the song repeats itself with some minor changes from the beginning – it’s not very adventurous compositionally but the catchy riffs and dreamy melodies lull the listener and make the repetition enjoyable. 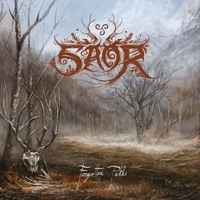 SAOR is one of the top bands or projects in the Atmospheric Black Metal niche and although I have some reservations about this release it is not a letdown by any means. Most of the album blows me away the same way the previous releases did: the music is emotive, the arrangements are gorgeous, the production is wonderful. Fans and non-fans alike should check this out.